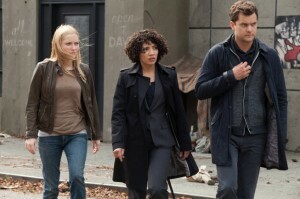 Fringe was one of our stops in our Vancouver set visit tour last week, and in honor of a new episode airing tonight, we thought we’d share some words with the incredibly fun and talented Jasika Nicole (Astrid) about what her character is going through in Season 5. It’s not the first time Astrid has seen something strange, but it’s definitely a new thing for her. 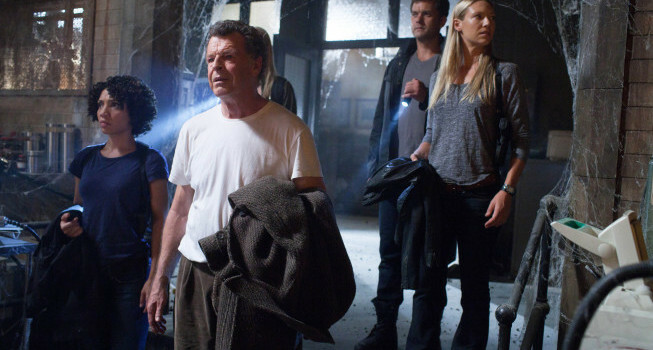 “She met her doppelganger, which was cool, but her environment has never been completely uprooted because of Fringe before and I think that she’s really into it. Which is weird. I’m sure that there are parts that are really scary and everything, but for the most part I think this is the biggest opportunity that she’s had to really to have her hands in the middle of trying to save the world, literally save the world,” she says. The biggest challenge or change for Astrid in 2036 is that she doesn’t have the ability to be anonymous like she used to be. Before, she could go out and do what she needed to do, and head back to the lab. “Now, because they are all wanted, she doesn’t have the freedom to leave unannounced. Nobody, does really, and so there are times of course when Walter wanders off as he does and it’s even more difficult when he does that in this new world than it has ever been before,” she says. And about Walter… does he know her name is Astrid, and not “Aspirin” or any of the other random names he seems to call her? “He knows her name,” Jasika says. “He does it to play with her and I think that when he gets her name wrong he’s actually very lucid and very aware of what’s going on and he knows he can mess with her. When he gets her name right, that’s when he’s not thinking about other stuff, he’s really focused, he’s got a one track mind. So, yeah, unless he’s, like, so, so, so happy and in the best place in the world and he actually gets her name right, and that would be pretty remarkable. I don’t know what it would take, though,” she says. Maybe getting high? “That’s what it is,” Jasika laughs. “Maybe if Astrid gets high with Walter, he will pay her the honor of getting her name correct.” Jasika is sure that Walter has a stash somewhere in 2036. “He’s got a lot of secret hiding places,” she says. 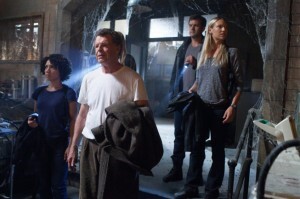 A new Fringe episode, titled “In Absentia,” airs tonight at 9PM (ET) on FOX. Take a look at some images!